Since the Statue of Unity, the period of formation of high-statuettes has begun in the country. In the last month, Prime Minister Narendra Modi inaugurated the statue of Unity (182 meters), the world’s tallest statue in Gujarat. This statue of Sardar Vallabh Bhai Patel is built on the Narmada river bank. But now the case is from Ayodhya, where the Banas Purshottam Ram’s 221 meter statue has been announced to construct a statue. Apart from this, the idol of Lord Shiva, Mother Kaveri and Shivaji is also being made in the country whose height will touch the sky. 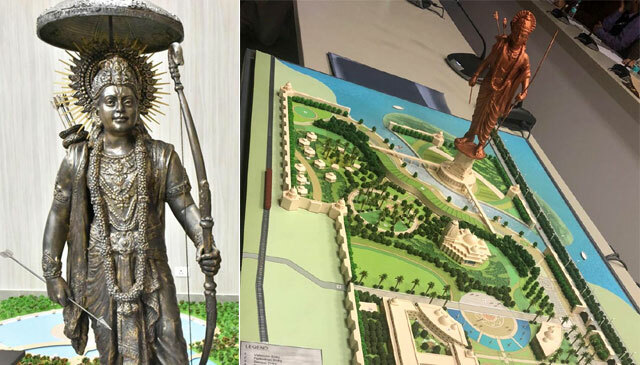 Amidst the reverberation of Ram … Ram in Ayodhya, the Uttar Pradesh government has decided to build a 221 meter high statue of Shriram on the Sarayu coast there. UP Chief Minister Yogi Adityanath agreed on this proposal on Saturday. This statue will be of bronze. A super-museum will also be built with Merti, which will have complete history related to Sriram. Actually, this statue of Lord Rama will be 151 meters. But above the statue will be a 20 meter high umbrella and a terrace of 50 meters below. According to the reports, the development of this scheme will be on land of more than 250 acres. Five architectural firms had put forward their work plan ahead of the Yogi. In addition to Amadya Purushottam Ram, the statue of Lord Shiva is being made, which will be 351 feet. According to the reports, the construction of the statue will be completed by March next year. This statue of Lord Shiva is being done on 16 acres of mountainous area of ​​Srinatha, 50 kilometers from Udaipur. After completion of the work the statue can be seen from 20 kilometers away. Let me tell you, the Mirage Group is manufacturing it.